The 2015 Sundance Film Festival is this weekend and Athens is well represented! There has been a lot of the usual "must see" press leading up - (ie The 10 Movies I'm Most Excited To See At Sundance 2015 & The Most Highly Anticipated Films At The 2015 Sundance Film Festival etc.) - and if you have been keeping up you might have noticed 2 of those "most anticipated films" were directed by folks that hail from Athens, Georgia. Add in an Athens composer doing the score of one and you got one heck of an Athens clan meeting up in Park City this weekend. How cool is that?? We are very proud to call these folks not just Athenians, but great friends and supporters of the Athens film scene. Check out their films below and wish them lots of luck from Athens! Georgia native, former UGA student, and co-creator of Homestar Runner - Craig Zobel has lived in Athens on and off again since 1996. His film "Compliance" had its premiere at the 2012 Sundance Film Festival. For 2015 Sundance, Craig's film Z for Zachariah will be premiering Saturday Jan 24th as part of the U.S. Dramatic Competition! The film score was composed by Athens' own Heather McIntosh - more about her Sundance experience below! 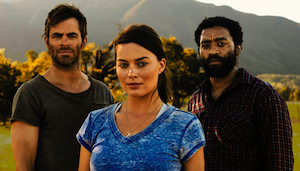 Z for Zachariah - Filmmaker Craig Zobel starring Chiwetel Ejiofor, Chris Pine, and Margot Robbie. This is director Craig Zobel's third feature to play at the Sundance Film Festival but his first in the U.S. Dramatic Competition. With his prior two films, he showed a commanding ability to find tension in the mundane and humanity in the horrific. In Z for Zachariah, he utilizes his full repertoire as a director, unleashing a forceful drama that searingly explores the nature of man . . . and woman. Boasting an exceptional cast whose impressive talents are on display,Z for Zachariah is a gripping tale that subverts expectations and works on many levels. —T.G. All of Athens knows James Ponsoldt, director of The Spectacular Now! Graduating fom Ceder Shoals High School, James talked up Athens GA to everyone when the Spectacular Now premiered at Sundance 2013. His other Sundace Film Festival premiers include Off the Black in 2006 and Smashed in 2012. For the 2015 Sundance Festival, James' latest film The End of the Tour will be screening Friday Jan 23rd (tonight)! In 1996, shortly after the publication of his groundbreaking novel Infinite Jest,acclaimed author David Foster Wallace (Jason Segel) sets off on a five-day interview with Rolling Stone reporter David Lipsky (Jesse Eisenberg). As the days pass, a tenuous yet significant relationship develops between journalist and subject. They share laughs, expose hidden frailties, yet it’s never clear when or to what extent they are being truthful. The interview is never published. The End of the Tour is based on Lipsky’s critically acclaimed memoir about this unforgettable encounter that he wrote following Wallace’s suicide in 2008. 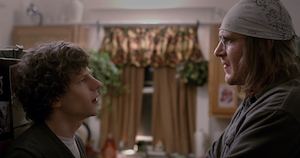 Deeply emotional, insightful performances from Jason Segel and Jesse Eisenberg lay bare a heartbreaking screenplay by Pulitzer-Prize winner Donald Margulies. Directed with humor and tenderness by Sundance Film Festival veteran James Ponsoldt (The Spectacular Now, Smashed) and befitting the troubled soul of Wallace himself, The End of the Tour is profound, surprising, and compellingly human. —D.C. Hugh Hodgson School of Music alumna Heather McIntosh is know around Athens for her work with Elephant 6 and AUX Festival. Heather is a on her way to Sundance 2015 as Film Composer for Craig Zobel's Z for Zachariah. This will be Heather's 3rd time at Sundance with a movie she scored - the other two were 2012 "Compliance" (directed by Craig Zobel) and 2013 "The Rambler" (directed by Calvin Lee Reader). In 2013, Heather was selected for a Sundance Institute Film Composers fellowship and is a 2014 Sundance Institute Time Warner Foundation Fellow. I mean really, how cool is that?? !